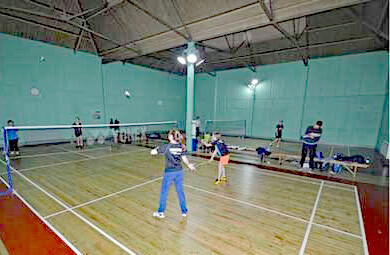 Harrogate Racquets is a family-friendly club where you can enjoy playing tennis, badminton and table tennis. Our membership ranges from occasional players through to national standards. We are a club operated by and for its members, with all profits reinvested back into the club. We actively promote sports within the Harrogate Area, including the hosting of the Annual Harrogate & District Tournament and one of the leading badminton tournaments in the UK. Our fantastic clubhouse has a licenced bar and full kitchen facilities, where we host many family fun events. Approach Harrogate on the Leeds road (A61) and turn left in to Firs Road opposite M&S food store, approximately 70 yards before a set of traffic lights. The courts are accessed via the door marked 'Badminton'.